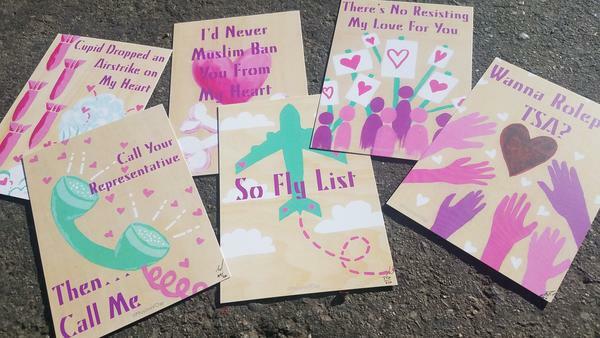 Valentine's Day cards created by artist and activist Tanzila Ahmed tackle Islamophobia with snark and humor. You can buy sappy Valentine's Day cards or silly cards or you can buy ones that take on Islamophobia. TANZILA AHMED: First, Muslim registry, then wedding registry. AHMED: This burqa is built for two. AHMED: You've hijacked my heart. KELLY: These are some of the Valentine's creations by Tanzila Ahmed. She's an LA-based writer and artist, and she's here now. Tanzila, welcome. AHMED: Thanks for having me. Happy Valentine's Day. KELLY: ...As we go through these cards. But I'm also squirming. Is that your intention? AHMED: Oh, good. That was completely my intention. I want people to squirm (laughter). KELLY: You want to make people uncomfortable? AHMED: I do. I think it is humorous and it is loving. But one of the things that happens with politics and when it comes to talking about Islamophobia and the politics around being Muslim, people kind of get numb to it. And with humor, you're kind of able to kind of sneak into people's consciousness and get them to think differently. KELLY: Do you have a favorite from this year's batch of valentines? AHMED: Yeah. I think my favorite one from this year is the so-fly list. AHMED: You have this no-fly list that so many of us are used to being on. So I like the idea of taking that back and calling it the so-fly list. KELLY: I mean, that's part of what you were trying to do here is challenge the stereotypes about Islamophobia. You're having fun but there's a serious message in there. AHMED: Oh, yeah, there's absolutely a serious message. I think - you know, I've been a political activist for about 18 years now. And it's so hard to get people to pay attention to your message. And you have to be creative, and you have to figure out how to use humor. And, you know, I was also just kind of tired of being serious all the time that, you know, I'm a Muslim American woman and I can have fun and talk about love and be a little bad. I don't always have to be that good Muslim narrative that people think that I need to be. KELLY: And how did you come up with the idea of marrying that sentiment with producing a pack of Valentine's Day cards? AHMED: You know, my whole life is a running gag. It started off as a joke on Twitter. I was doing publicity for an anthology I was in called "Love, InshAllah: The Secret Love Lives Of American Muslim Women." And all these interviewers were asking me about, you know, do Muslim American women actually experience love? And I was like, this is just dumb. This is ridiculous. We're just as regular people as any other regular people. These questions are very Orientalizing and fetishizing. So I wanted to take it back. So I just started kind of letting off steam on Twitter with the #MuslimVDay. And then I had some friends who were like, make me these cards. I was like, this was just a joke. I didn't really want to. And so I made it - the first year, I made it for my friends only. And then the second year, I made a little bit more. And then I sell them on Etsy now. KELLY: Who buys them? Is it mostly a Muslim audience that's attracted to these? AHMED: I think so. I think that's who my audience is for a lot of my work. But I do have a lot of folks that are white who will buy them for their Muslim significant other, which is kind of cute. And people will buy it for their friends. KELLY: Do your cards make Muslims uncomfortable? Do you hear that kind of feedback? AHMED: Oh, yeah. My cards definitely do make Muslims uncomfortable. I think there's this perception that when Muslims present themselves in mainstream culture, that we're supposed to present this good Muslim narrative, not causing waves. KELLY: Not being snarky, yeah. AHMED: Yeah, not being snarky. Not - I mean, this is probably true in all religions that you're not supposed to be crass or dirty, have dirty humor. And there's definitely discomfort there. KELLY: ...And did it for a few years. And then there came a point where you were like, I think I'm done. The project is finished, it's played itself out. AHMED: Yeah, correct. And then the elections happened for the 2016 cycle and there was just so much material to work with. The Islamophobia that we're experiencing in America has escalated to this level that I just did not think we would ever be at. And I think given the time, we need humor and love to kind of push back on it. KELLY: Tanzila Ahmed, creator of Muslim Valentine's Day cards. Tanzila, thanks so much. AHMED: Thank you for having me. (SOUNDBITE OF LEROY ANDERSON'S "THE TYPEWRITER") Transcript provided by NPR, Copyright NPR.